Knowing how to read your water meter correctly can help you to, not only know if you are being billed correctly, but it can also help you catch a leak before it becomes a bigger problem. Sweep Hand- For each full revolution of the sweep hand one cubic foot of water or 7.48 gallons has passed through the meter. 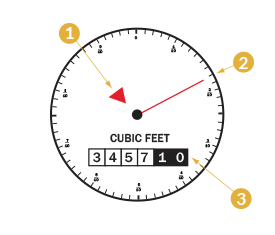 The smaller markings on the face of the meter indicate tenths and hundredths of a cubic foot. Meter Register- These numbers keep a running total of all the water that has passed through the meter. All over the country there are reports of shortages in affordable housing, especially for those who are looking to retire. Retirees want a place of their own that is low in maintenance, great in amenities and easier on the wallet. When looking around for such housing many are finding that the Mobile Home/Manufactured Housing lifestyle fits within these categories. In the past mobile homes, or trailers as they were once referred to, were viewed as dwellings for “low income” individuals. Although mobile homes themselves are often more cost conscious to purchase than a stick built home, the communities they are placed in are breaking free of the “trailer park” stigma and are growing into very desirable places to live. To refer to them as “low income” housing is to skew the reality of who is living in these homes and communities. With more people wishing to downsize these communities are no more “low income” than the stick build communities that often surround them. The average cost of a new single wide (unplaced) in California is $43,400 (US Census) and the average cost of a new unplaced double wide is $98,000. These prices appeal to those wishing to be free of a mortgage payment, and the communities appeal to those wishing to be free of large yard and or pool maintenance. Many people choose to first find a community they like and then purchase within the community. When a person chooses to do this they are not only paying for the real property value of the home but they are also paying for the location, amenities and lifestyle the community is offering. For example a 2001 single wide home in a community across the street from the beach, with a pool and a clubhouse will cost more than the same home in a community more inland, even if that community has the same amenities. Do not forget about the space rent. When a person chooses to place their home within a park/community OR when they purchase a home already in place in a community they are not purchasing the land. The park owner is renting the land the home sits on. The rent paid is used to maintain the roads, outdoor lighting, landscape, utilities, and amenities and also allows the owner of the property to gain a return on their investment. The rents range from community to community and can increase yearly; these increases often go toward upkeep within the community. It is important to keep the current rent as well as future increases in-mind when purchasing a home. A person needs to make sure that they can continue to afford the rent for the entirety of their stay within the park. So if you are considering downsizing, looking to get out of an apartment, or looking for the perfect retirement abode, you may find that a mobile home community is more affordable and more luxurious that you thought.